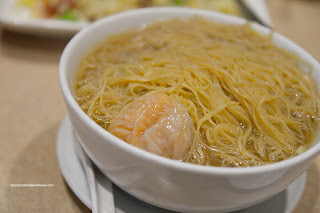 For me, whenever I am on vacation, I end up craving wonton noodles somewhere along the way. I'm not sure why it happens really. In theory, I can easily survive on North American food indefinitely, but I just suddenly get the urge. The urge to satisfy my Asian heritage. I guess that also explains my erratic driving and inability to use a turn signal once I took the exit onto Westminster Hwy from Hwy 99... Hey, when in Rome... After a U-Turn (hey, did you expect any less? 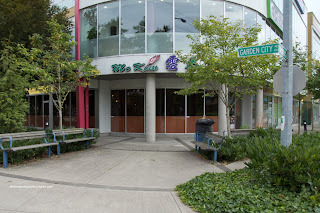 ), we made our way to McKim Wonton Mein Saga. We've been to the location on Kingsway and came away mildly satisfied. 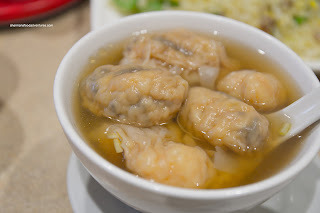 It is well-known that they make good wontons, but in my opinion, there are better. On that note, we started with a bowl of their famed Wonton Noodles. The noodles were fairly al dente, yet slimy. The broth was flavourful (where we could taste the shrimp shells), yet it was a bit heavy on the white pepper. The wontons were modest in size with a somewhat dense wrapper. However, less filling means more wrapper. The large pieces of shrimp were crunchy and mildly seasoned (we could really pick out the sesame oil and white pepper). A solid bowl of wonton noodles. For good measure, we got a bowl of the Sui Gow Soup. Naturally, there were similarities between this and the wonton noodles. With the addition of wood ear mushrooms and being bigger, the sui gow had more of a crunch and the wrapper was less apparent. As with the wonton noodles, we thought the portion size was quite good. When there are wonton noodles, there is also Congee. 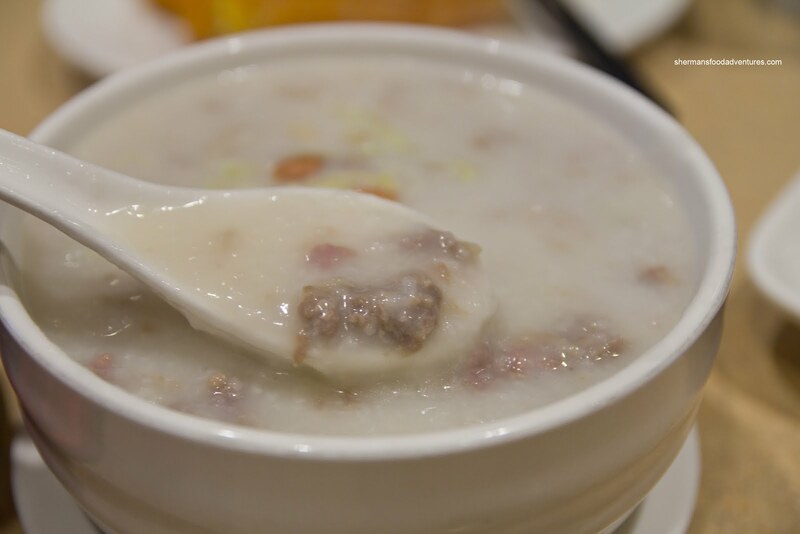 We ended up with the Ground Beef Congee and it was a pleasing thickness. It was silky and stayed thick until the last spoonful. There was good amount of tender beef which was seasoned enough so it had flavour without making the congee salty. As per usual, we got a Salty Donut (or Yau Jah Gwei) as an accompaniment). It was light, crispy and only somewhat greasy. Trying to hit all the Chinese staples, we added an order of the Pan Fried Rice Noodles with Beef. Since rice noodles tend to stick quite easily, this dish is often very greasy. In this case, it wasn't too bad as it wasn't glistening much. 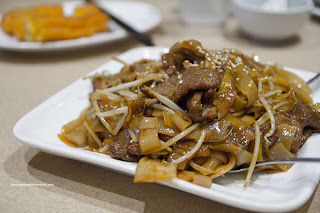 Intermingled with the nicely fried noodles were large tender slices of beef which were thick and easy to eat. Furthermore, the flavour of the entire dish was a bit smoky due to the good wok heat. It helped caramelize the ingredients. And to go with the fried noodles, we had the Yeung Chow Fried Rice (or BBQ Pork & Shrimp Fried Rice). We asked for them to omit the green onions and they seemed to put in more than usual. We didn't send it back and just ate it anyways. 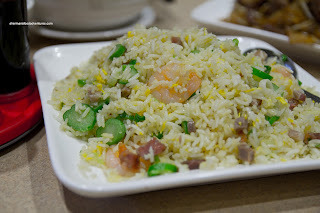 As evidenced in the picture, there was a whackload of ingredients including crunchy shrimp (which were well-seasoned), meaty BBQ pork and crisp slices of gailan stalks. We found the rice to be chewy, not oily and mildly seasoned. To get our veggie fix, we got 2 small orders for the Tong Choy and Gai Lan. The tong choy was prepared quite nicely with a vibrant green colour (which turned pale later, but that is normal) and a crisp texture. There was enough fermented tofu and garlic to flavour each and every stalk. 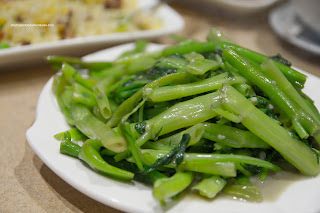 As for the gai lan, some stalks were overcooked, yet again, it was prepared properly maintaining a deep green hue. Overall, it was a solid meal, if not pretty standard. I'm not convinced they make great wontons, yet they are decent. At the very least, it satisfied our cravings after returning from holidays.